Shawn's Bicycle Adventures: You cycled where?!? 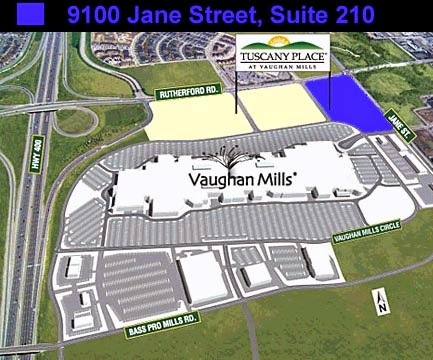 Vaughan Mills Mall, located in Vaughan at Highway 400 and Rutherford Road, is a shopping and entertainment complex of colossal proportions. 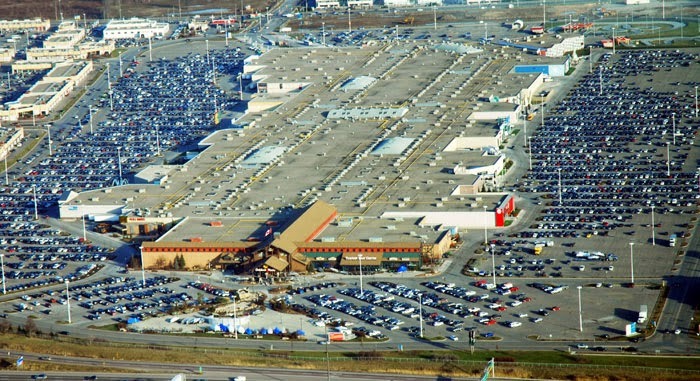 With over 1.2 million square feet (110,000 m²) of retail space, all on a single floor, it is the 11th largest mall in Canada and 6th largest in the GTA. It's often a stressful drive to get there, particulary during the evening rush or on weekends. This is the result of car-centric planning, which has consequently made every other mode seem difficult and uninviting. I rode my bike there last week. My route was mostly on minor roads (except a short segment on Jane on the sidewalk), it was quick (quicker than a car during rush hour), and relatively easy. The most challenging part of the ride was crossing the 4-lane ring road that surrounds Vaughan Mills. The intersection circled in red below is a controlled by stop signs, which ends up being really unconfortable to cross by bike or two feet. It's not often that you see such a big intersection controlled by stop signs. The crosswalk doesn't even have curb cuts. The second issue I have is with the bike parking. 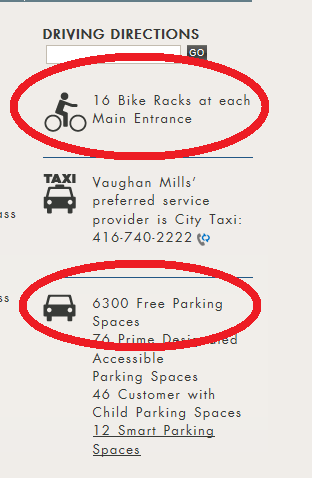 Their website clearly says 16 bike racks at each main entrance (in addition to 6300 free parking spaces for cars). I biked around the mall and found a total of 6 bike parking spots for the entire mall (2 spots at entrance #2, and 4 spots at entrance #4). Entrances #1, 3, 5, and 6 had no bike parking, unless you count the light poles. For what is such a significant urban centre, and traffic generator, I expected better. I didn't see any bike parking at the Transit terminal at Vaughan Mills either. 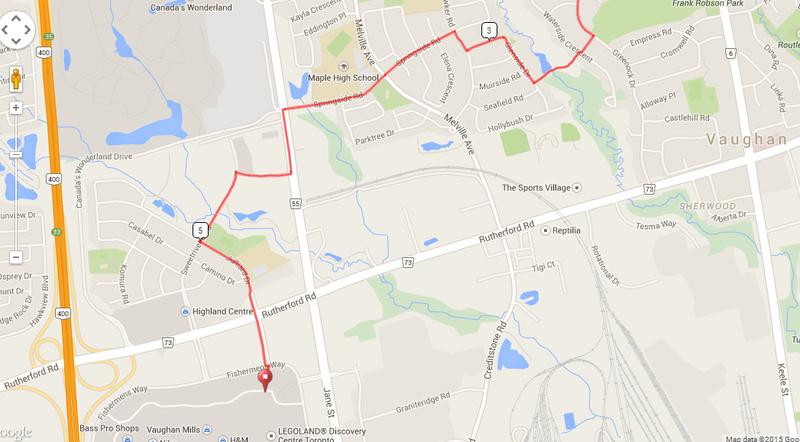 Here's my bike route from Vaughan City Hall to Vaughan Mills Mall. If you ask most people, they'd think it is crazy to ride your bike to Vaughan Mills. I would say they are crazy not to. Have you seen the traffic on Rutherford Road at 5pm? You can by-pass that traffic on a bike, and arrive with a smile on your face. the absence of bike racks at the bus terminal was a surprise for me too. There definitely is plenty of space to put one in near the west side of the platform. Like you, I too have attempted to ride to Vaughan Mills by bike. My approach though was from the west on Rutherford over the hwy 400 overpass. Let me tell you, that stretch of road is not for the faint of heart. Car driver's speed exceeding the posted limit by 10-15 kph. Despite there being sidewalks on either side of Rutherford, I wouldn't feel comfortable as a pedestrian either.